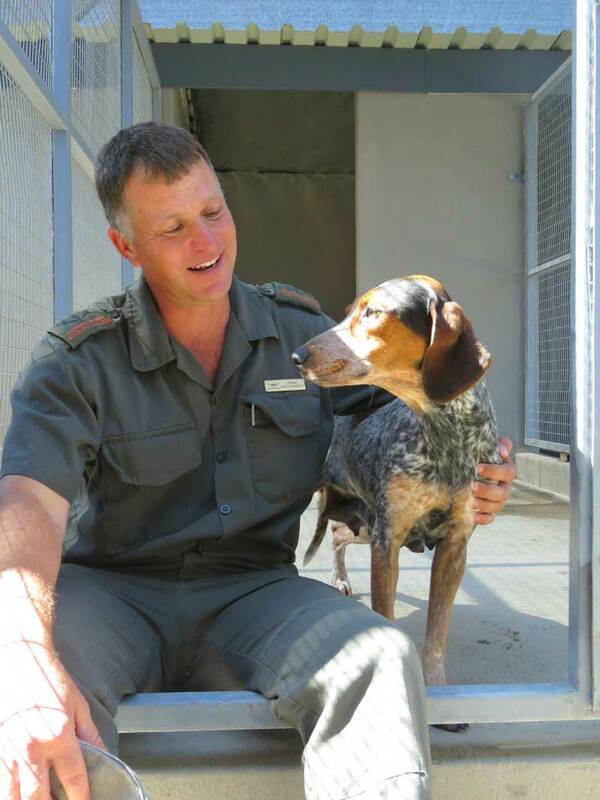 The feeding of the SAWC’s K-9 unit’s dogs is an expensive exercise – to the tune of about R 20 000 per month. There is no getting away from the fact that our dogs need to be fed, so let’s do it ‘right’. This is where Pack Leader, the distributors of ACANA and ORIJEN dog food in South Africa, come into the picture. This progressive company started their involvement with the SAWC Dog Unit in October 2016. 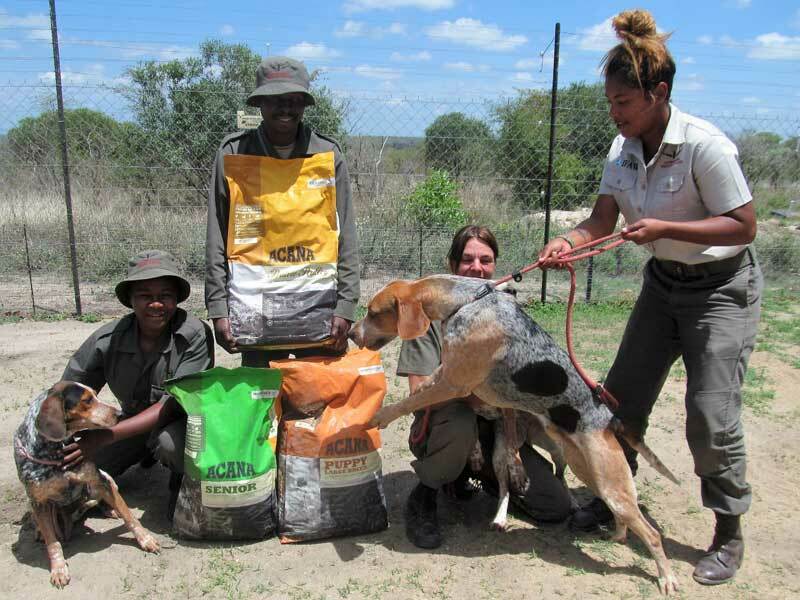 Leaders in the field of canine nutrition, Pack Leader wanted to ensure optimal nutrition for this highly active, counter rhino poaching dog unit. The goals for the nutrition and feeding of all working dogs are to maintain optimal body condition and weight, support performance, and prevent fatigue and injury. Of greatest concern is energy. Natural protein based ACANA and ORIJEN dog foods are the ideal diets for these canine athletes, providing nutrition designed to nourish dogs according to their evolutionary adaptation to a diet rich and diverse in fresh protein. All working dogs will have energy needs that are higher than comparable dogs living a more sedentary lifestyle. However, the duration and the intensity of their work will determine the magnitude of this difference. Dogs working at low or moderate intensity for long periods of time, like these SAWC’s dogs, will require a consistent increase in caloric intake to maintain body weight and benefit from a diet with an increased proportion of metabolisable energy calories supplied by fat and protein. Athletic conditioning leads to increases in blood volume, red blood cell mass, capillary density, and mitochondrial volume. The increased tissue mass associated with such a training regime and these activities must be supplied by additional protein in the diet. In addition, there is a slight but significant increase in protein catabolism during endurance exercise associated with an increased rate of skeletal muscle turnover. Finally, it is estimated that up to 10% of energy in exercising dogs can be derived from the metabolism of gluconeogenic amino acids. Biologically Appropriate™ ACANA and ORIJEN dog food represent a new class of meat-based canine diets. Their Biologically Appropriate™ philosophy is simple: Mirror the quantity, freshness, and variety of meats and fish that dogs evolved to eat. The grey wolf (Canis lupus) is the ancestor and closest relative of all domestic dogs (Canis lupus familiaris), sharing 97% of their DNA. Despite centuries of man-controlled breeding, the internal workings and anatomical capabilities of domestic dogs remain to this day the same as their wild ancestors, so it’s no surprise that their food requirements remain the same too. Feed the K-9 units dogs a diet similar to that of their wolf ancestors is very much the thinking behind the unit’s feeding regime and so for the past year they have been fed Acana exclusively – with excellent results. Our dogs are in beautiful condition with sleek shiny coats, no excess fat and boundless energy. A recent and significant donation of dog food from Pack Leader of a variety of Acana feeds has gone a long way towards keeping the K-9 units running costs down – for which all of us involved with the hounds are extremely grateful. Pack Leader’s continued support for this unit is very much appreciated.